Simplify field-installation time for your 19" rack-mount transit cases with a Signal Entry Panel from DEI. 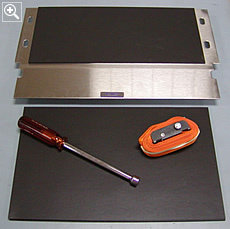 Panel easily mounts in a 19" rack-mount case. Panel provides a single location for all required signal connections, eliminating hard-to-reach connections. 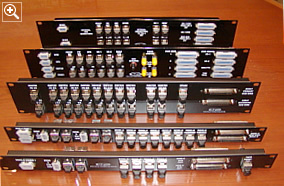 Panel includes feed-thru panel-mount connectors for all required signal connections. Silk-screened labeling clearly identifies all connections. Each panel is customized to meet your unique signaling needs. Add mechanical support for your critical rack-mount components with the Rack-Mount Support Kit from DEI. 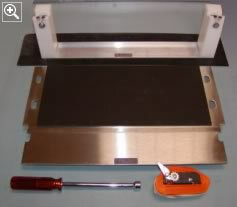 16 gauge stainless steel Support Tray with stiffening channel provides rear support for the lowest rack-mounted component. High-strength nylon Adjustable Strap secures all Support Kit and rack-mounted components. Nut Driver allows for easy adjustments to Strap. Four 1/16"-thick Foam Cushions provide cushioning between rack-mounted components. Adjustable Support Bracket provides bracing for the top-most rack-mounted component. 1U, 2U & 3U standard heights. Other heights available. 1/16"-thick Rubber Cushion provides cushioning between Support Bracket and rack-mounted component. Nut Driver allows for easy adjustments to Support Bracket and Adjustable Strap. Properly ground your 19" rack-mount transit cases with a Rack-Mount Grounding Kit from DEI. 1/4" copper Ground Bar includes two 1/4-20 studs for connecting straps and ten #10-32 holes for connecting wires. Bar may be mounted to vertical rails in a rack's U-space, or to a horizontal rail, leaving U-space for other components. Rod Clamp Assy connects the Bar to a 3/4" ground rod. C-Clamp Assy connects the Bar to a 3/4" ground plate. Spring Clamp Assy connects the Bar to a 1" component. Case Strap Assy connects Bars in adjacent cases. 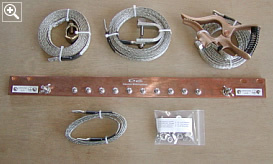 Ground wires and other ground straps available.